FILE - A still image taken from video provided by ABC-15, shows investigators at the scene of a fatal accident involving a self-driving Uber car on the street in Tempe, Arizona, March 19, 2018. A video of the crash showed the driver looking down just before the vehicle struck and killed Elaine Herzberg, 49, in what is believed to be the first death involving a self-driving test vehicle. Uber said in a company release that it has worked closely with the NTSB and is doing an internal review of its self-driving vehicle program. The company also has brought in former NTSB Chairman Christopher Hart as a safety adviser. "We look forward to sharing more on the changes we'll make in the coming weeks,'' the release said. The company declined to comment further. FILE- This file image made from video March 18, 2018, of a mounted camera provided by the Tempe Police Department shows an exterior view moments before an Uber SUV hit a woman in Tempe, Ariz. In a preliminary report on the crash released May 24, 2018, federal investigators said the autonomous Uber SUV spotted the woman about six seconds before hitting her, but didn’t stop automatically because emergency braking was disabled. The report came a day after Uber pulled its self-driving cars out of Arizona, eliminating the jobs of about 300 people who served as backup drivers and performed other jobs connected to the vehicles. 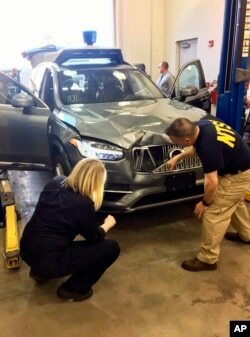 Uber had suspended testing of its self-driving vehicles in Arizona, Pittsburgh, San Francisco and Toronto while regulators investigated the cause of the March 18 crash. In an interview with the NTSB, Uber's backup driver said she had been monitoring the "self-driving interface.'' Although her personal and business telephones were in the vehicle, she said neither was in use at the time of the crash.